The PM Synchronous Motor Drive (AC6) block represents a classical vector control drive for permanent synchronous motors. This drive features a closed-loop speed control based on the vector control method. The speed control loop outputs the reference electromagnetic torque of the machine. The reference direct and quadrature (dq) components of the stator current corresponding to the commanded torque are derived based on vector control strategy. The reference dq components of the stator current are then used to obtain the required gate signals for the inverter through a hysteresis-band current controller. The main advantage of this drive compared to scalar-controlled drives, is its fast dynamic response. The inherent coupling effect between the torque and flux in the machine is managed through decoupling (stator flux orientation) control, which allows the torque and flux to be controlled independently. However, due to its computation complexity, the implementation of this drive requires fast computing processors or DSPs. In Simscape™ Electrical™ Specialized Power Systems software, the PM Synchronous Motor Drive block is commonly called the AC6 motor drive. The speed controller sampling time has to be a multiple of the vector controller sampling time. The latter sampling time has to be a multiple of the simulation time step. 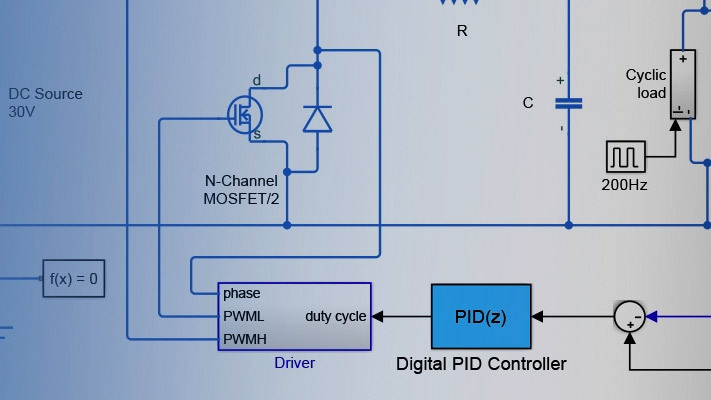 The average-value inverter allows the use of bigger simulation time steps since it does not generate small time constants (due to the RC snubbers) inherent to the detailed converter. For a vector controller sampling time of 75 µs, good simulation results have been obtained for a simulation time step of 75 µs. The simulation time step can, of course, not be higher than the vector controller time step. The stator current direct component id* is set to zero inside the vector controller block because the rotor flux is supplied by the permanent magnets. See Mechanical Coupling of Two Motor Drives. The Permanent Magnet Synchronous Machine tab displays the parameters of the Permanent Magnet Synchronous Machine block of the Fundamental Blocks (powerlib) library. The Rectifier section of the Converters and DC Bus tab displays the parameters of the Universal Bridge block of the Fundamental Blocks (powerlib) library. For more information on the Universal Bridge parameters, refer to the Universal Bridge reference page. The DC bus capacitance (F). Default is 2000e-6. The braking chopper resistance used to avoid bus over-voltage during motor deceleration or when the load torque tends to accelerate the motor (ohms). Default is 8. The braking chopper frequency (Hz). Default is 4000. The dynamic braking is activated when the bus voltage reaches the upper limit of the hysteresis band. The following figure illustrates the braking chopper hysteresis logic. Default is 320. The dynamic braking is shut down when the bus voltage reaches the lower limit of the hysteresis band. Default is 310. The chopper hysteresis logic is shown in the following figure. The Inverter section of the Converters and DC Bus tab displays the parameters of the Universal Bridge block of the Fundamental Blocks (powerlib) library. For more information on the Universal Bridge parameters, refer to the Universal Bridge reference page. The average-value inverter uses the following parameters. The frequency of the three-phase voltage source (Hz). Default is 60. The on-state resistance of the inverter devices (ohms). Default is 1e-3. Select hysteresis or space vector modulation. The default modulation type is Hysteresis. When you click this button, a diagram illustrating the speed and vector controllers schematics appears. The maximum change of speed allowed during motor acceleration (rpm/s). An excessively large positive value can cause DC bus under-voltage. This parameter is used in speed regulation mode only. Default is 1000. The maximum change of speed allowed during motor deceleration (rpm/s). An excessively large negative value can cause DC bus overvoltage. This parameter is used in speed regulation mode only. Default is -1000. The speed measurement first-order low-pass filter cutoff frequency (Hz). This parameter is used in speed regulation mode only. Default is 100. The speed controller sampling time (s). The sampling time must be a multiple of the simulation time step. Default is 7*20e-6. The speed controller proportional gain. This parameter is used in speed regulation mode only. Default is 5. The speed controller integral gain. This parameter is used in speed regulation mode only. Default is 100. The maximum negative demanded torque applied to the motor by the current controller (N.m). Default is -17.8. The maximum positive demanded torque applied to the motor by the current controller (N.m). Default is 17.8. The vector controller sampling time (s). The sampling time must be a multiple of the simulation time step. Default is 20e-6. The current hysteresis bandwidth. Default is 0.1. This value is the total bandwidth distributed symmetrically around the current set point (A). The following figure illustrates a case where the current set point is Is* and the current hysteresis bandwidth is set to dx. This parameter is not used when using the average-value inverter. This bandwidth can be exceeded because a fixed-step simulation is used. A rate transition block is needed to transfer data between different sampling rates. This block causes a delay in the gate signals, so the current may exceed the hysteresis band. The maximum inverter switching frequency (Hz). Default is 20e3. This parameter is not used when using the average-value inverter. Click to show or hide the parameters of the Autotuning Control tool. Specify the damping factor used for the calculation of the Kp and Ki gains of the Speed Controller (AC) block. Default is 0.9. Specify the desired settling time of the Speed Controller (AC) block. This is time required for the controller response to reach and stay within a 5 percent range of the target value. Default is 0.1. Specify the ratio between the bandwidth and natural frequency of the regulator. Default is 30. Compute the Proportional gain and Integral gain parameters of the Speed Controller (AC) block. The computation is based on the Desired damping [zeta], Desired response time @ 5%, and Bandwidth ratio (InnerLoop/SpeedLoop) parameters. The computed values are displayed in the mask of the Drive block. Click Apply or OK to confirm them. The mechanical input: load torque (Tm) or motor speed (Wm). The mechanical output: motor speed (Wm) or electromagnetic torque (Te). The library contains a 3 hp drive parameter set. The specifications of the 3 hp drive are shown in the following table. The ac6_example example illustrates an AC6 motor drive simulation with standard load condition.